Music lovers wanting to hear live tunes without going to a concert or club or leaving the comfort of their home can use new computer apps that connect them to events in venues around the world. Although event-streaming sites like Livestream offer some live concerts, these apps are tailored exclusively for music and try to capture the atmosphere and social aspects of a live show. "Going to a concert is about the music. But it's also about the shared experience of watching that music with all these other people," said Judy Estrin, the chief executive of Redwood City, California-based company Evntlive. Evntlive streams concerts of well known and indie artists on its namesake Web app, which was launched last month and is accessible on mobile devices. Some concerts can be viewed for free. But for others, there is a fee of between $2.99 and $5.99. The company works directly with musicians and venues to stream the shows. Concert Window, which relaunched its Web app to make it accessible on mobile devices, streams approximately 25 live concerts each week, with fees ranging from free to $5. The New York City-based company provides equipment such as cameras to artists and controls the broadcast remotely. Two thirds of the profits go to musicians. Both Evntlive and Concert Window offer social features so music fans can chat with others in real-time, learn more about an artist, or watch related videos about the performer. "It's about redefining what live performance means online, as opposed to saying it's just a linear experience where all you want to do is capture it and stream it," said Estrin. Spacebar, a new app for the iPhone, focuses exclusively on streaming audio. Any musician with an iPhone can stream a performance on the app, whether they're in a concert hall or at home. The first five minutes of streaming is free and then it costs 99 cents. Fans can also tip artists. "We are mainly targeting the artists that headline in the small clubs. Small- to medium-sized clubs that fill 100 to 200 people," said Gregory Miller, co-founder and executive producer of Spacebar, based in San Francisco. About a dozen live concerts are accessible through the app each week. Evntlive also has on-demand content from previously recorded concerts. 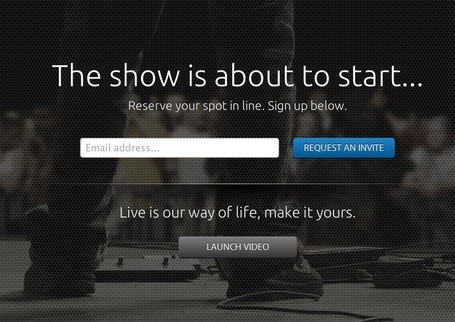 Concert Window plans to launch on-demand content in the near future. Dan Gurney, the chief executive of Concert Window, said online concerts are the next best thing to being at a live concert. "There's nothing better than kicking back on your couch after a long day of work and enjoying some live music," he said.